Solid performances, strong characters and a great script that is both smart and funny make Chris Moore’s sophomore effort Triggered well worth a watch. 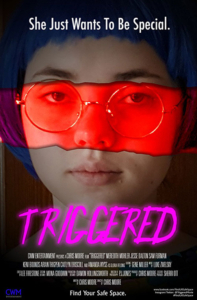 Triggered tells the story of two teenagers who fake an attack by their town’s legendary serial killer to cover their own wrongdoing. While the two teens are enjoying the attention of being “victims”, their plan takes a dark turn when the real killer is inspired to resurface and go after them. Chris Moore’s script is solid and pulls no punches. The film succeeds largely because of its strongly written characters and ability to find razor sharp humor in its biting social commentary. Moore is a filmmaker who knows his voice and has a clear vision with the ability to see both successfully realized and carried through. 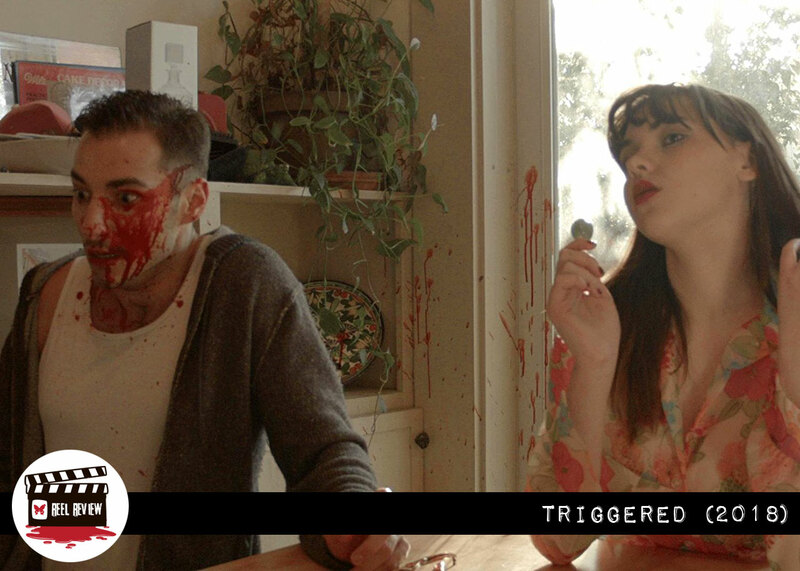 Horror and dark comedy are two difficult genres to pull off, and ‘Triggered’ effortlessly blends both in a highly entertaining film. All of that, and I’m a sucker for a good Weekend at Bernie’s reference! The main character, Callee, is smartly written to speak up for every social cause, fighting for justice through her outrage. Yet she feels no compassion for the lives of other people and is ultimately focused on only herself. Ironically, as aware of others as Callee is, she is not aware of herself enough to realize that. This conflict within Callee is what holds the entire film together, and Meredith Mohler is superb in making the character work in an incredibly deep and rooted performance. Amanda Wyss is the perfect counterbalance to Callee as Principal Fielding. Her character is the adult mentor that Callee doesn’t know she needs. Wyss plays the role with a sturdy sweetness that shows she’s experienced more than she lets on. In one scene, Principal Fielding attempts to reach out to Callee with a touching, personal story. As she is bravely telling her story, Callee is scrolling through social media on her phone, only occasionally looking up to offer Principal Fielding the attention she deserves. The story seemingly falls on deaf ears, as Callee doesn’t seem interested in the story she thinks she’s too smart to hear. 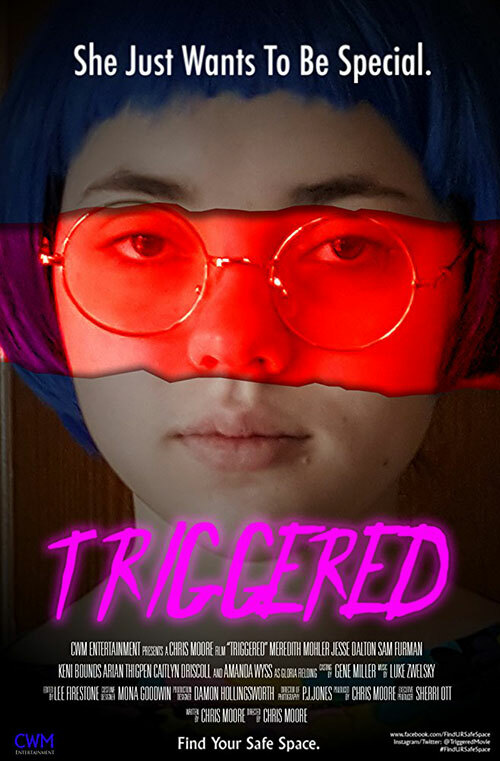 ‘Triggered’ is an inspired genre mix of dark comedy, horror, and mystery about the evils and anxieties that run through even the quietest towns and the deepest parts of the human mind. It’s a fresh feeling film with a layered story, fantastic script, and spot on performances that should play really well on the festival circuit. I enjoyed writer/director Chris Moore’s previous effort, Blessed Are the Children (read that review here), but Triggered is a huge step up for the filmmaker. 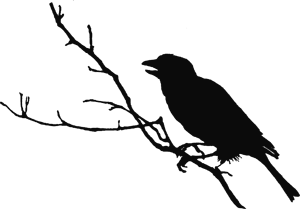 If you find yourself somewhere it’s playing, I can’t stress enough that you go check it out. It would be a lot of fun to see with a crowd, and this deserves to be on your watch list.